Ashley: "We were there [at Farley Chamberlayne] for about 8 weeks. It was a very remarkable group. I'd say it's maturity was unmatched. Because we lived in that house all kinds of combinations were possible. And I wouldn't separate Sandy and Richard, everyone contributed to Liege and Lief sounding the way it did, Swarb, Mattacks...and Simon was such an important steadying influence. I remember it being a great shock to people when we appeared for that classic Royal Festival Hall concert where Nick Drake supported us and Dave played a solid electric fiddle for the first time and it blew people apart." 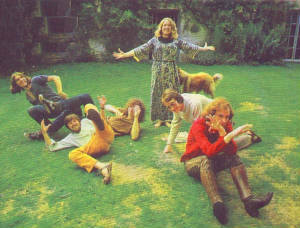 Liege And Lief was launched with a sell-out concert in London's Royal Festival Hall late in 1969. Dave Swarbrick had made a huge contribution to the project and he now joined Fairport full-time.